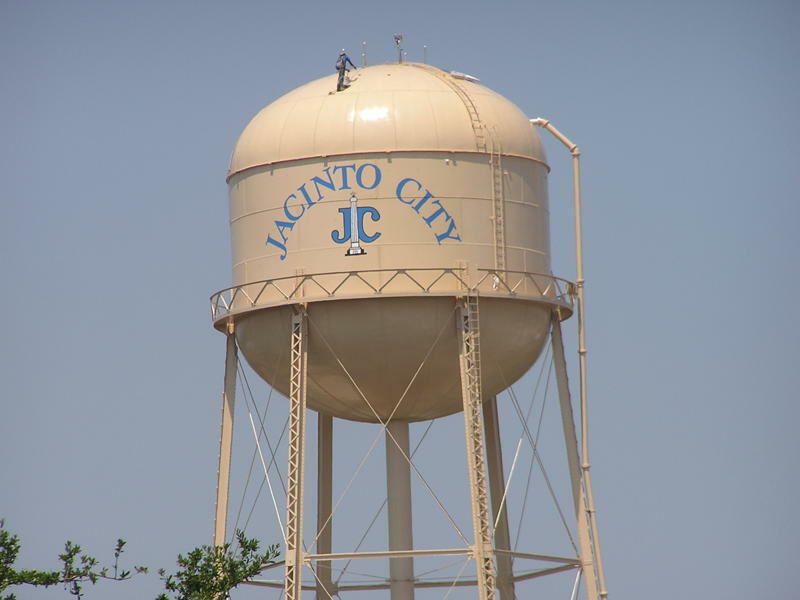 Jacinto City Water Tower. Courtesy of the City of Jacinto City. Image available on the Internet and included in accordance with Title 17 U.S.C. Section 107. Map of Jacinto City. Image available on the Internet and included in accordance with Title 17 U.S.C. Section 107. JACINTO CITY, TEXAS. Jacinto City is at the intersection of U.S. Highway 90 and Interstate highways 10 and 610, on the Missouri Pacific Railroad near the San Jacinto battleground in central Harris County. It began in 1941 when Frank Sharp built a small subdivision, which rapidly filled with shipyard workers and others employed at local steel mills and war plants. Inch Chandler, the first mayor, opened a grocery, and the community incorporated in 1947 with a population of nearly 3,800. Controversial meetings of the city council led to the formation of three separate chambers of commerce. A city hall and recreational facilities were constructed in the 1950s, and by 1966 the city, which derived its name from the San Jacinto battlefield, had two public schools, a hospital, a bank, a library, and seventeen churches. Most residents worked at local refineries. Schoolchildren attended Galena Park and Houston schools. Residents' complaints of chemical vapors in 1969 may have contributed to the construction of a waste water treatment facility, funded by the Environmental Protection Agency, in 1972. State highway maps in the 1980s showed Whittier school and Furr High School at the townsite. The population rose from 6,800 in the 1950s to 9,500 by 1960, reached a high of 11,500 in 1964, and was 9,343 in 1990. The population grew to 10,302 by 2000 and to 10,553 in 2010. Handbook of Texas Online, Diana J. Kleiner, "JACINTO CITY, TX," accessed April 20, 2019, http://www.tshaonline.org/handbook/online/articles/hfj01.